Lonely Planet: The world's leading travel guide publisher Lonely Planet Pocket Tenerife is your passport to the most relevant, up-to-date advice on what to see and skip, and what hidden discoveries await you. Explore the Museo de la Naturaleza y el Hombre in Santa Cruz de Tenerife, celebrate... read more Carnaval with the locals and relax on beautiful beaches; all with your trusted travel companion. Get to the heart of the best of Tenerife and begin your journey now! 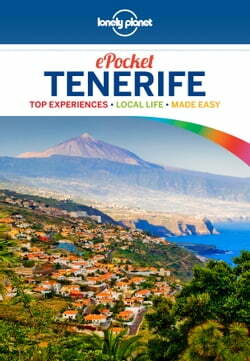 Inside Lonely Planet Pocket Tenerife: Full-colour maps and images throughout Highlights and itineraries help you tailor your trip to your personal needs and interests Insider tips to save time and money and get around like a local, avoiding crowds and trouble spots Essential info at your fingertips - hours of operation, phone numbers, websites, transit tips, prices Honest reviews for all budgets - eating, sleeping, sight-seeing, going out, shopping, hidden gems that most guidebooks miss Free, convenient pull-out Tenerife map (included in print version), plus over 15 colour neighbourhood maps User-friendly layout with helpful icons, and organised by neighbourhood to help you pick the best spots to spend your time Covers Santa Cruz de Tenerife, El Cuadrilataro, Puerto de la Cruz, La Orotava, Los Cristianos, Playa de las Americas and more eBook Features: (Best viewed on tablet devices and smartphones) Downloadable PDF and offline maps prevent roaming and data charges Effortlessly navigate and jump between maps and reviews Add notes to personalise your guidebook experience Seamlessly flip between pages Bookmarks and speedy search capabilities get you to key pages in a flash Embedded links to recommendations' websites Zoom-in maps and images Inbuilt dictionary for quick referencing The Perfect Choice: Lonely Planet Pocket Tenerife, a colorful, easy-to-use and handy guide that literally fits in your pocket, provides on-the-go assistance for those seeking only the can't-miss experiences to maximise a quick-trip experience. Looking for a comprehensive guide that recommends both popular and offbeat experiences, and extensively covers all of Tenerife's neighbourhoods? Check out our Lonely Planet Canary Islands guide. Looking for more extensive coverage? Check out our Lonely Planet Spain guide for a comprehensive look at all the country has to offer. Authors: Written and researched by Lonely Planet. About Lonely Planet: Since 1973, Lonely Planet has become the world's leading travel media company with guidebooks to every destination, an award-winning website, mobile and digital travel products, and a dedicated traveller community. Lonely Planet covers must-see spots but also enables curious travellers to get off beaten paths to understand more of the culture of the places in which they find themselves.